Owing to the 30 degree spiral pattern discussed in the previous section, crystals classically have six sides and six faces (not with spheres, but we’ll get to that in a moment). As a result they have four axes of energy. An axis is a particular plane or direction. 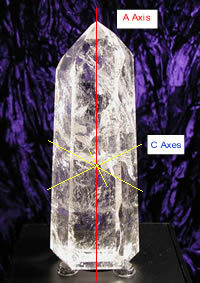 To define the axes imagine a classically shaped crystal is sitting on its base, with the front of the crystal toward you (or look at diagram 2, or better still do both!). The axis that runs from the bottom to the top is the “A” axis. This is the main axis of energy. Coming out from each of the sides is another axis. These run perpendicular to the main axis and the sides, and are called the “C” axes. There are three altogether. (see diagram 2 ) The angle between each of these is 60 degrees. The energy coming out of the crystal spirals up these axes, running with the main A-axis . The energy spiral can be very tight and focused (as with a wand) or very broad and sweeping (several feet or metres) with a large generator. So the energy spirals up the crystal and out the top. This is what is channelled out when a wand is used for healing. That energy can also be used for firing what you want to manifest into the ethers. In elestials the axes may not be obvious as they are often irregular in their shape. With a pendulum it is possible to find the axes, but it is usually not necessary. You can still use the crystal for laying down programs. A program is essentially what it is that you are trying to create magically. You define what it is that you want, create a picture in your mind, fill it with as much joy and love as you can, and place it into the crystal.